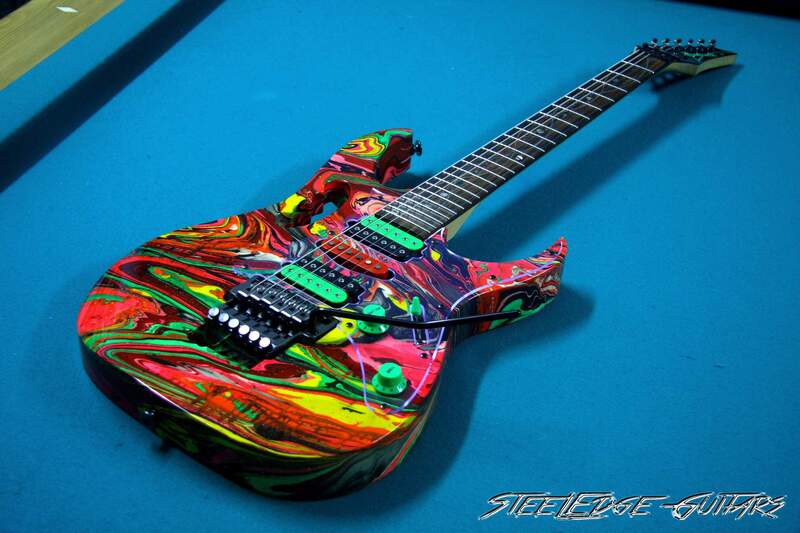 This guitar is, for me, the best JEM ever made and one of the finest and most beautiful work of art by Ibanez. This DNA is also very unique and special because of the awesome swirl pattern, you don´t see many of these often. Limited to 300 pieces worldwide and released in year 2000, as one of the 2K Editions by Ibanez, these guitars have blood of Steve Vai himself mixed with the paint on the body (that´s where the DNA model comes from). 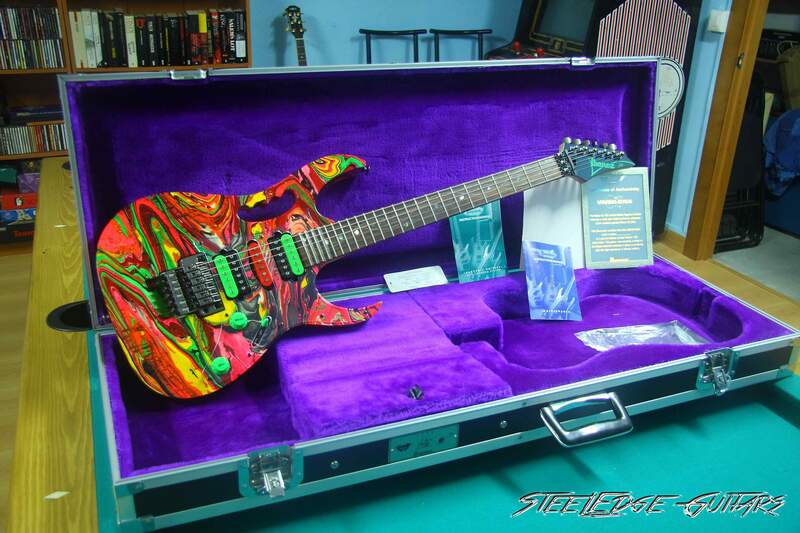 Is one of the most appreciated Jem´s ever, and one of the Ibanez guitars that more will appreciate in value for sure in the future. 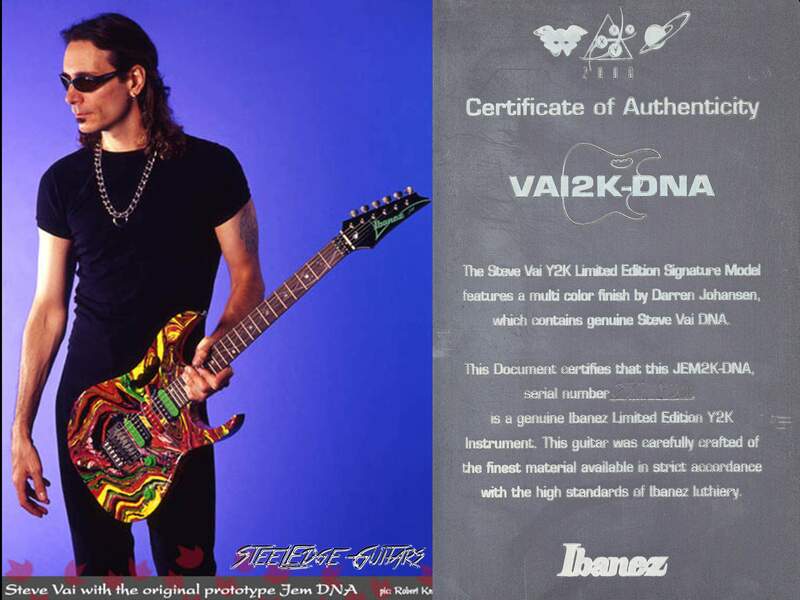 The Jem2KDNA or VAI2KDNA is maybe the most sought after and appreciated Jem ever, and one of the most prized in the guitar collector world. 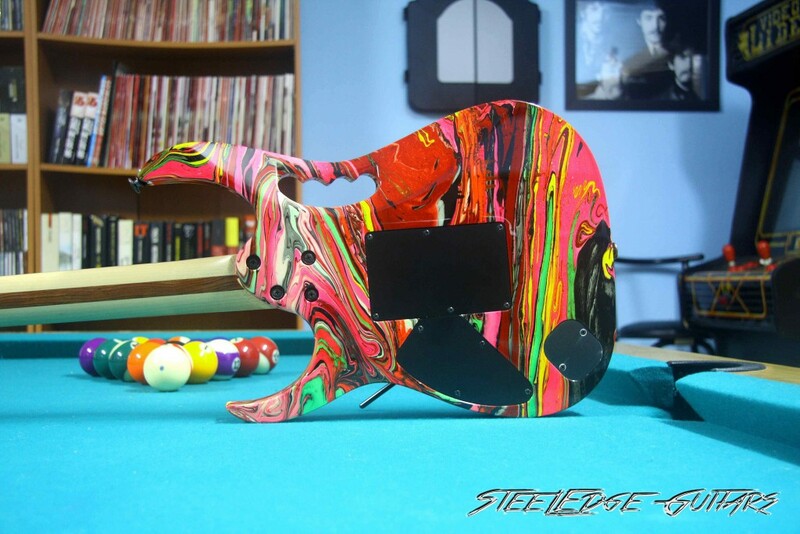 It comes with the SWIRL finish made by Darren Michaels from ATD (About Time Designs), who also made the original late 80´s and 90´s swirls of the UV77MC, PMC and GMC, which makes every guitar have an unique pattern different from each other, like a fingerprint. Mixed with the paint, there is blood of Steve Vai himself, which was donated by him for this project, so there is DNA of Mr. Vai in the guitar, and that´s why the name of the model. 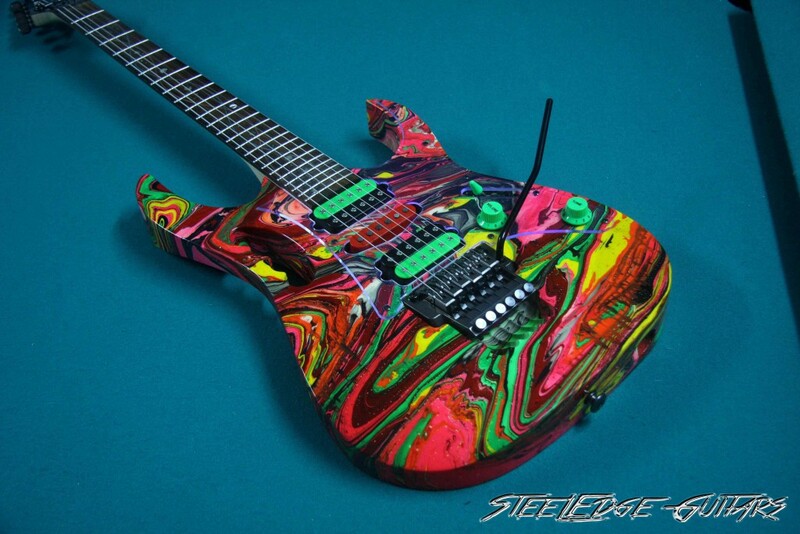 The proportion of blood/paint is approximately 1/8, and this freaky detail makes this guitar very special to any Vai fan. Also, the 2K comes because was a limited edition in year 2000, when 2 others 2K guitars were made, the Benson 2K and the famous JS 2K Crystal Planet. They were made in the Hoshino Ibanez Custom Shop plant, using the best woods available at the time, and the craftsmanship is just awesome. 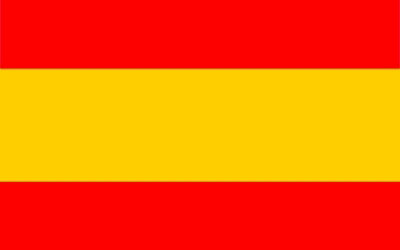 There are just 300 pieces worldwide, and they don´t pop up often for sale. Is almost impossible to find a good one under the $7000 price tag, and if you want a MINT UNPLAYED condition one, with a killer swirl like mine has, they go as high as $10.000…and even more. It depends on the guitar and the market situation, but this guitars have been increasing in price every year, and as time goes by, there are less DNA in MINT condition, so, they are more prized. – American Basswood body, with multicolour handmade SWIRL finish by Darren Michaels from ATD, with 1/8 of Vai´s blood on it. 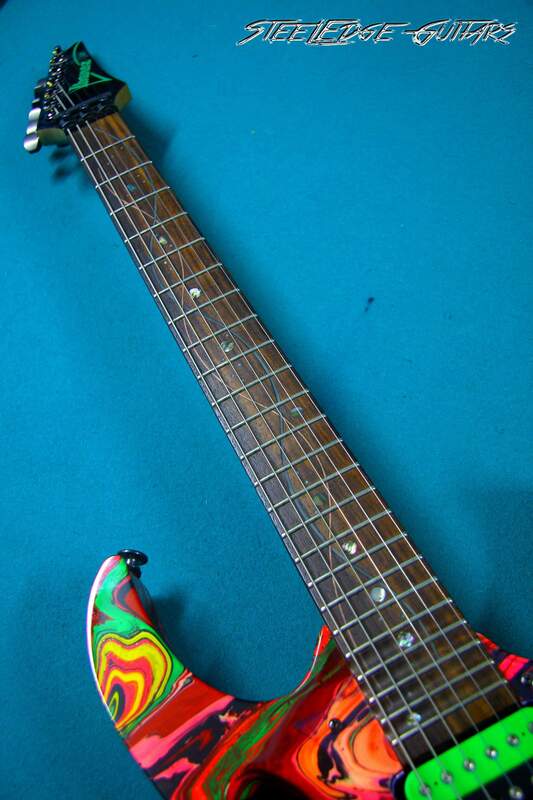 – Rosewood Fretboard with DNA green and blue pattern inlays, 24 frets, scalloped from 21 to 24. – DiMarzio The Breed pickups, with DNA finish, Humbucker-Single-Humbucker. Mine is #277 out of #300, and as you can see in the pics, the swirls is awesome, very beautiful with lot of colours, very twisted, a true eye catcher. 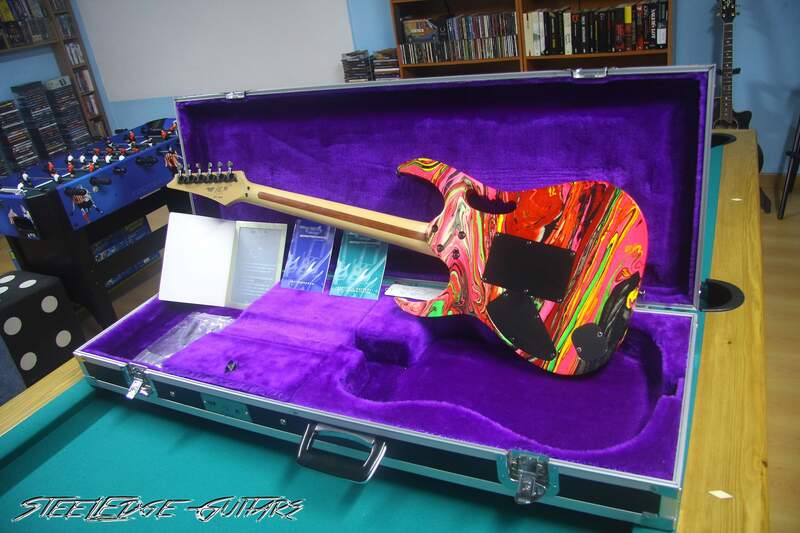 You can see Vai´s blood dripping from some lines of paint 😉 .The guitar is just amazing, it comes with a special commemorative exclusive Flight Case, and along with the case candy, it has a Certificate of Authenticity signed by Vai, which has a “hologram” finish that makes it really cool. 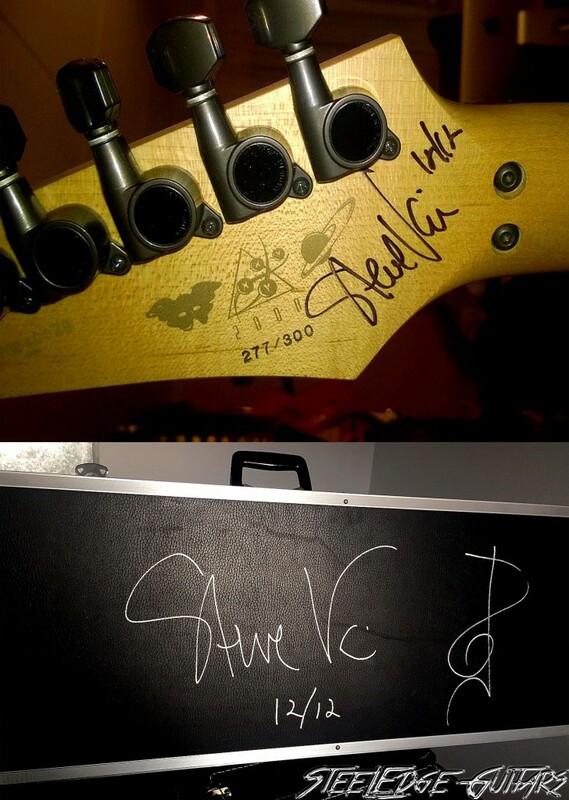 Also, I was lucky enough to have this guitar signed by Mr. Vai himself in the back of the headstock and the hardshell case, which makes this guitar even more special to me. Just opening the case for the first time is an astonishing view….if you look close to the guitar, you can see there´s a lot of detail and craftsmanship from the Ibanez Hoshino Custom Shop on it, the finish on the frets, the action, the woods, the weight….everything points that you have a very special guitar in your hands. About the playability, the guitar allows extremely low action, is very similar to a regular Jem, but easier to play, smoother, and has better finish and feel in the neck. It comes with the classic Jem neck, which was different on the Jem 10th Anniversary, which is thicker, but the woods used on the 2KDNA are far above the rest, and you can clearly feel it, your hand literally flies over the neck. The inlays are also exclusive to this model, the make a pattern similar to a DNA helix, with green and blue colours, going down the fretboard similar to the Tree Of Life inlays of the classic Jem 7Vwh.The grain of the rosewood fretboard is outstanding, I have not seen rosewood fretboards of this quality very often. About the sound, the guitar comes with the new Breed pickups, which are different from the classic Evolution pickups or the PAF PRO.I´d say the Breeds are a mix between both pickups, is a more bass / powerful sound, with more sustain than the Evolutions, but has the classic rock feel and punch of the PAF PRO.Is more “heavy” sounding, goes more into the Les Paul classic rock sound, but with the modern sound and harmonics of the Evolution pickups. Playing in clean settings, it sounds more rounded, not so thin as other Jems, and if you add distortion is a very hard rock guitar, not so gritty as the Jem7Vwh, is more aggressive in the low and the mid range, and with more sustain. For me, the killer swirl on this concrete DNA, along with the sound and playability, condition, and the exclusivity of the model, makes this guitar one of the more special pieces in my collection, and one of the best Jems ever. How did I get this guitar? Well, it has its own little history, as these very-sought-after guitars don´t pop up often for sale and they are not cheap, so you have to search well, be ready, and have the money to pay for it in the right moment. 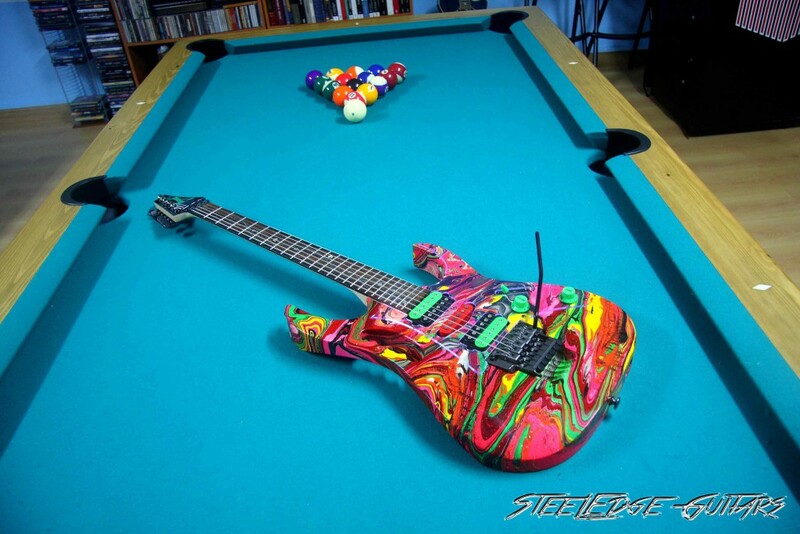 This beauty belonged to one of the most known Ibanez Collectors Worldwide, a French guy who is a good friend of mine, which selected this concrete unit because of its beauty and its awesome swirl. Unfortunately, he had to sell to finance other guitar he was after, and was bought by a common friend in the Netherlands, who uses to buy and resell cool guitars for a living. He sold the guitar after a while to a nice guy from the UK, and, after the original owner tried to buy her back with no luck (he didn´t have the money when the owner decide to sell) I was warned of the sale by a friend and bought it. The original owner and I are still good friends, and if I ever decide to sell this DNA, I have the promise of giving him the possibility of have it back first. Funny thing is, after owning it for a couple of years, I was forced to sell because of some personal issues I had at the time, and my friend wasn´t able to buy her back, so it went to a good friend of mine who is a collector but not a guitar player, who kept it in perfect condition for 4 years…I was so sad every time I looked at pics of this Jem…a lot of people asked me about it, if I still owned that killer Jem, saying that was one of the best swirl ever…and I had my heart broken every time I saw a pic of this guitar at my friends home. So…beautiful, unique, very musical, pleasure to play….you just can´t describe this guitar with words, you have to look, feel and hear it to have an idea of such wonderful instrument it is. As I said, the guitar is brand new, almost unplayed. It still has the original tag and strings on it when I bought it. I don´t play it, just in very special occasions and only in my studio wearing soft clothes and playing gently, so no mark on it is made. My main idea is to keep it MINT as a collectible item and enjoy looking at her and playing occasionally. Every people that look at my collection gets impressed by the beauty of this guitar (and my collection has some awesome pieces! ), but the overall look of this guitar is killer even for people that don´t know anything about guitars. If I keep this guitar mint, in the near future will be a very prized piece among guitar collectors, is a very interesting investment and a guitar to enjoy owning. Vai is one of my guitar heroes and a reference when you talk about guitars, and this is for sure one of his most beloved guitars. 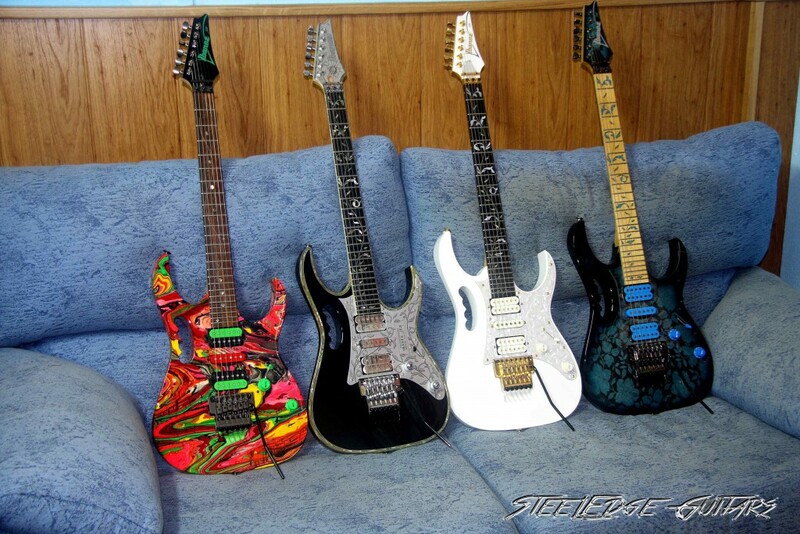 And as far as there is no 2 same looking Jems, every guitar has something special on its own. After so many years seeking one, I´m very proud of owning this guitar, it really was worth every cent I paid for it…and more!. I had to sacrifice 3 of my guitars to buy it, but it was really worth it, is one of the pinnacles of my collection, a must have for any Ibanez fan and a obsession for all Vai fans. Ibanez is maybe my favourite brand of guitars, is the brand that started my interest for guitars, and this concrete Ibanez represents very well the philosophy, work and identification of the brand. This is my 4th Jem, along with the classic and always associated to VAI Jem7VWh, the beautiful and rockin´ Jem77BFP and the astonishing cool look and sound of the Jem 10th Anniversary. Each one is a masterpiece on its own way, with different personality, but I can´t deny that the DNA is my favourite among the others. Not every people is so lucky of having these 4 beauties in a couch, so I feel really blessed.